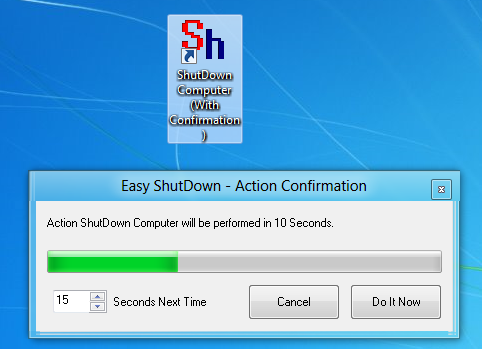 Shutdown Windows 8 with a desktop shortcut easily , quickly and with configurable confirmation screen. The Shutdown Shortcut can shutdown windows 8, windows 7 or even older windows versions such as windows xp, windows vista, etc. Just create a desktop shortcut to shutdown a windows computer as displayed below and double click on that shortcut to shutdown windows 8 computer really easily. Shutdown Shortcut named as Shutdown Computer (With Confirmation) can be created on Desktop and just like any other shortcut can be copied to quick launch screen or can be pinned to the JumpList to initiate system shutdown. The Shortcut can also be renamed appropriately or you can even copy the command line of the shortcut to use it in a batch file or any other scheduling program or software. The Shortcut to Shutdown Windows 8 computer can be programmed to display a timer for configurable number of seconds and in case you would like to can the shutdown, just click on the cancel button of the confirmation screen. Once the Shortcut is launched, Windows 8 will notify all the running applications that a system shutdown has been initiated. In case you windows 8 pc does not have any application running with unsaved data, the windows 8 will shutdown normally.